In Western art, the one individual depicted more than any other is Jesus of Nazareth. Even though I don’t have statistics to back up that statement, it’s a reasonable assumption, don’t you think? Jesus has been a subject of paintings almost since the invention of paint, and because artists were commissioned by the Church for centuries, different images of Jesus must number in the thousands. (That does not include apparitions of Christ on grilled cheese sandwiches or tree stumps.) Some of the most memorable art objects in history, and by the most renowned artists, feature Jesus: just to name a couple, there are Leonardo’s “Last Supper” and Michelangelo’s “Pietà”. The one image that has been reproduced more than any other, though, is by an artist whose name you probably don’t know. If you have ever set foot in a Protestant Sunday School or church social hall, especially in the southern or midwestern United States, it’s highly likely you have seen “The Head of Christ” by Warner E. Sallman. Estimates vary, but a 2007 article in Newsweek pegged the total number of copies of this painting at a billion. Yes — billion, with a b. That number includes reproductions on clocks, coffee mugs, lamps, calendars, and other objects of religious devotion. Sallman was a Chicago commercial artist; a charcoal illustration he sketched in 1924 for a denominational publication was the prototype for the famous oil painting he did in 1940 — the one shown here. During World War II, pocket-sized reproductions were given away to soldiers and sailors by the YMCA and the Salvation Army; presses churned out tens of thousands of them. In the 1950s, framed prints of “The Head of Christ” showed up on the walls of libraries, schools, and community centers in addition to churches. The painting became so popular, hardly anyone stopped to wonder why. Among those who did wonder why were art critics, who pointed out that Sallman’s painting was not in the tradition of great religious art. I suspect that may have been a big part of its appeal. The thousands of art works in which Jesus had previously figured usually put him in a scene: He was a baby in a manger, or a suffering savior on a cross, or an unearthly figure working a miracle of some sort. There were a few “portraits” (the Met has a nice one attributed to Rembrandt), but in most cases, Jesus is shown in some activity; some historical context. What was unusual about Sallman’s painting is that the subject doesn’t appear to be centuries old. 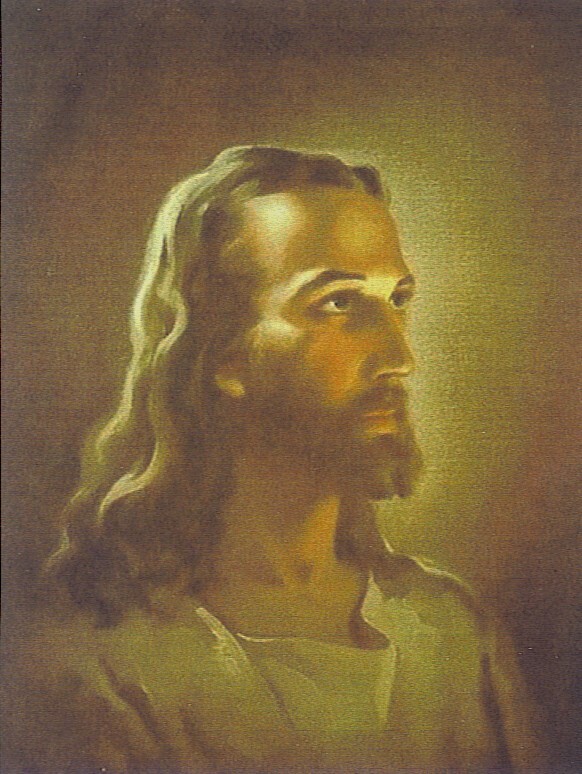 It looks like Jesus had his picture taken in a shopping mall. One might also quibble that Warner Sallman, who was of Swedish descent, has made Jesus look sort of Scandinavian in this painting. What may have turned it into an iconic image, though, is that Christ was presented to the viewer as more or less a contemporary. That idea of Jesus as a friend — someone whose picture you could carry in your wallet — seems to have been powerfully attractive to 20th century Protestants. This entry was posted in Art and tagged iconography. Bookmark the permalink. This head of Jesus painting was the first thing I saw when I first entered The Little Brown Church in the middle of the night in 1976. It was in 1983 when I began attending and it was then I met you and Sally there. You two were so instrumental in my early years as a Christian, modeling along with Larry and Virginia what a Christian family man was. I look from time to time at writing credits of shows I think have a good moral script and think of you. In your profile picture you look good and healthy. All is well here in Hays Kansas and God continues to keep a picture of me in his wallet. Love to Sally , the kids and I gather by your profile photo, grandkids.